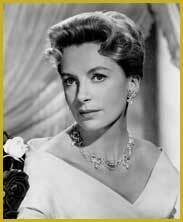 A gifted, sensitive leading actress, born in Helensburgh, Scotland on September 30, 1921, Deborah Kerr landed her breakthrough screen role in 1940 as a frightened Salvation Army worker in Major Barbara. Originally trained for the ballet, she turned to stage acting getting experience in British repertory theater before moving to films. Kerr was given the lead in Love on the Dole (1940), the Michael Powell-Emeric Pressburger adaptation of the controversial novel that was England's equivalent of The Grapes of Wrath. Although she did well in films, it was when she played three roles as the various women in Colonel Blimp’s life in the time-spanning saga The Life and Death of Colonel Blimp (1943), that she became a star. She followed that with excellent performances as the mousy wife who enters wartime service in Perfect Strangers (1945); the Irish spy in I See a Dark Stranger (1946); and especially, a stunning, award-winning performance as the determined yet fallible Sister Superior who attempts to establish a school and hospital in a remote Himalayan castle in Powell and Pressburger's Black Narcissus (1947). Kerr was nominated for an Academy Award six times without ever winning but she received an Honorary Oscar at the 1994 ceremonies for her lifetime achievements. Later, she confirmed that she was suffering with Parkinson's disease and had been confined to a wheelchair. She died on October 16, 2007. 1984 Won Festival Trophy for her body of work. 1946 2nd place NYFCC Award – Best Actress The Life and Death of Colonel Blimp, Love on the Dole (1941), Tied with Joan Crawford for Mildred Pierce (1945). 1960 Won Star on the Walk of Fame – Motion Picture on 8 February 1960.